KISS' Eric Singer and Tommy Thayer join legend Alice Cooper and Sebastian Bach for "School's Out" at Chuck Brennan's Rock And Roll Academy on Thursday, March 28, 2013 in South Dakota. SIOUX FALLS, S.D. (AP) — Kiss frontman Gene Simmons made a surprise appearance at a Sioux Falls benefit concert Saturday, where he spoke of music's power to positively shape children's lives. Simmons's appearance came on the final day of a week of concerts to benefit the music academy for Sioux Falls Boys & Girls Clubs members. "This is about kids. We've had our chance. We've got to give them a chance. Anything that gets them off the street is a good thing," Simmons said. Music, Simmons said, is self-empowering. "It doesn't matter if you become a star. If you don't believe in yourself and get up on stage, everybody is watching. You can feel the power ... and it helps you get through life, especially when you're impressionable." He said getting involved in music — whether it's learning to play an instrument or sing karaoke — improves social skills, too. Motley Crue singer Vince Neil was also at Saturday's show, and he, too, expounded on the positive benefits of music. "Say you finish your first song, it could be 'Mary Had a Little Lamb,' it doesn't matter, but at least it's something you've played," Neil said. "And I think for kids, they could go into a whole other direction because they accomplished something." Neil said he was 10 when he first started taking guitar lessons. "I was terrible," he said laughing. "That's why I'm not a guitarist. I went into the other direction." 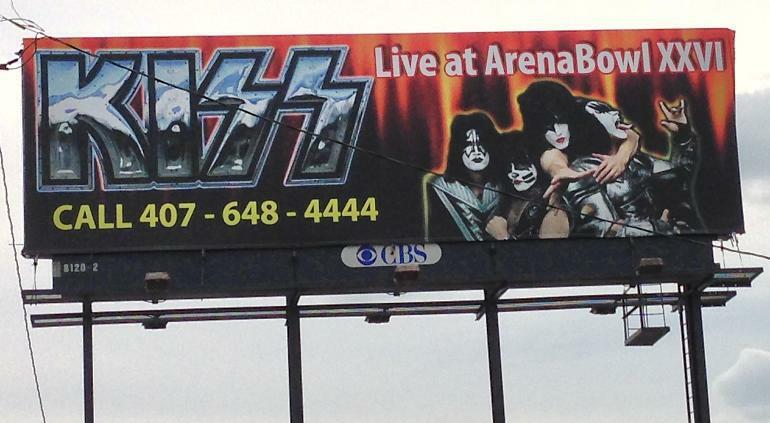 Check out this KISS billboard for their upcoming appearance at the ArenaBowl in Orlando, Florida. The band will perform in concert on Friday, August 16th as part of the ArenaBowl festivities. A KISS ARMY members-only pre sale will take place next week for this show. Thanks to George Navarro for sending KOL the image! Legendary rock band KISS will perform during ArenaBowl XXVI weekend this August 16th in Orlando, Florida, as this unprecedented partnership with The Arena Football League and CBS Sports was proudly announced on Tuesday. KISS, known for their elaborate and explosive stage shows, iconic black and white face paint, and never ending love of helping their KISS Army Fans to remember to “Rock and Roll All Night and Party Every Day” are returning to Orlando for the first time since 2006. KISS, lead by the original founding partners of Paul Stanley and Gene Simmons, has sold more than 100 million albums worldwide over the last four decades and notched eight Top 10 albums, highlighted by hit songs such as “Rock And Roll All Nite” and “Calling Dr. Love”. The recently released Number 1 MONSTER Album from KISS has been hailed by critics as the bands greatest studio album in years. Go to KISSONLINE.com for more. ArenaBowl XXVI is set to be played at the Amway Center in Orlando on Saturday, August 17. The game will be broadcast live on the CBS Television Network at 1 p.m. as part of the 3 day weekend celebration. Editor's note: In the Human Factor, we profile survivors who have overcome the odds. Confronting a life obstacle -- injury, illness or other hardship -- they tapped their inner strength and found resilience they didn't know they possessed. KISS singer Paul Stanley explains how he became the frontman for one of the most successful rock bands in America, despite being born deaf in his right ear. This article initially ran in 2011; we're republishing as KISS gears up for the second leg of its world tour, which kicks off June 1. (CNN) -- I was born with a Level 3 Microtia, which is a congenital deformity of the cartilage of the outer ear, and occurs in approximately 1 out of every 8,000 to 10,000 births. There is no ear canal and no direct path to the inner workings of the ear. Except for bone conduction, I'm virtually deaf on my right side, as there is no access for sound to enter. I've had an implanted hearing aid for years now. This is a device that is usually given to children at an early age or to adults who have lost their hearing due to a medical condition. This has been an ongoing adjustment for me as my brain has never processed sound coming in from my right side. In the beginning, it was incredibly taxing and extremely confusing. It would be like you are suddenly developing an eye in the back of your head. That said, it has settled in quite a bit and I have to say, it has enhanced my day-to-day activities. People often ask if my hearing problem has had any impact on my career. It's sometimes hard for people to understand that you don't miss what you've never had. When blind people speak about seeing or colors, it's very personal to them. In the same way, I may not hear music the way other people hear it, but I have nothing else to compare it to, or didn't for most of my life. I haven't felt at a loss for anything. I have no sense of the direction of sound, yet I have no trouble mixing a stereo album. I hear the expanse or width of sound but I can't necessarily tell you where it's coming from. Times have changed greatly since I was a child. Medicine, particularly advancements in hearing health, has greatly evolved. If there is a way to improve your hearing, then by all means, take the initiative and do something about it. To young and old alike, take care of your hearing because once you lose it, you can't get it back. Use earplugs if you're exposed to loud noise for prolonged periods of time including concerts. Keep personal listening devices to safe, acceptable levels. There are better ways to listen without sacrificing your enjoyment or your hearing health. To those of you that suffer from some form of hearing loss, take comfort in the fact that many, many great people have succeeded in monumental ways without normal hearing, or any hearing for that matter. Hearing loss may be a small pothole in the road, but that doesn't mean it should stop you from getting where you want to go. I'm living proof! 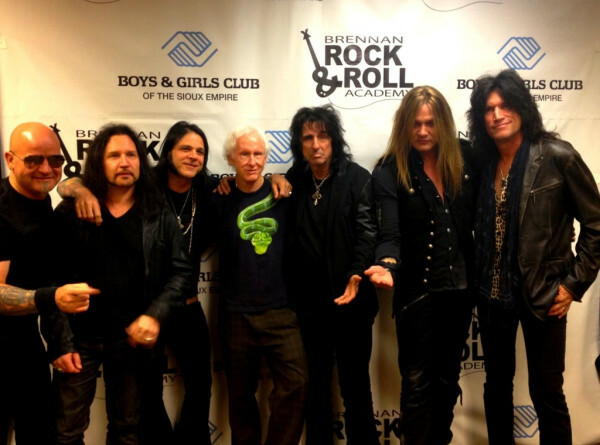 Here's a photo of Joey Allen (Warrant) Eric Singer, Chuck Garric, Robby Krieger, Alice Cooper, Sebastian Bach, and Tommy Thayer at Chuck Brennan's Rock And Roll Academy on Thursday, March 28, 2013 in South Dakota. Brennan Rock & Roll Academy was established to help children uncover and develop their love, passion and talents through the power of music. Through positive education and encouragement from kind and gifted musicians the students learn music, performance and industry skills while learning to dream bigger and believe in themselves more by gaining self-confidence through something they are truly excited about… music, the universal language. 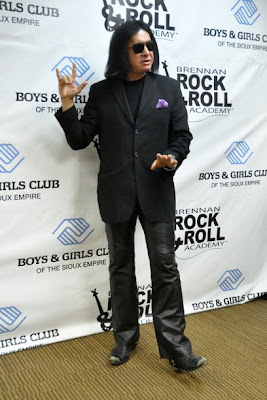 Brennan Rock & Roll Academy will provide music education for Boys & Girls Club kids that focuses on Rock & Roll instruments: guitar, bass, keyboard, drums, and vocals. Members of the Boys & Girls Clubs of the Sioux Empire will be able to receive weekly one-on-one lessons with professional musicians, along with weekly band rehearsals to prepare for upcoming concerts. As they continue to cultivate their skills, they will participate in a live performance in front of a real crowd. Super cool transportation will allow kids to attend the Academy and/or the Eastside Boys & Girls Club. A pair of Rock and Roll Hall of Famers took the stage Thursday in South Dakota for the first show in a week of concerts benefiting a music academy for Sioux Falls Boys & Girls Clubs members. Alice Cooper and guitarist Robby Krieger of The Doors jammed with a who's who of '80s glam and metal to help christen the $3.6 million Brennan Rock & Roll Academy in Sioux Falls. Also performing: Joey Allen of Warrant, former Skid Row frontman Sebastian Bach, and Eric Singer and Tommy Thayer of KISS. "These guys all know my songs, so I'll be doing four or five of my songs, and then a couple of Doors songs," Cooper told The Associated Press before the show. He said he was looking forward to performing the late Jim Morrison's parts on "Break on Through (To the Other Side) and "Back Door Man." "I'm filling in for Jim tonight. I've done it many times," Cooper said. The all-star band also planned to perform some KISS songs and a little Skid Row. The $1,000-a-ticket concert is a fundraiser for the center, which is the brainchild of Sioux Falls native Chuck Brennan. Brennan, the founder of short-term lender Dollar Loan Center, based his idea on Cooper's Solid Rock Foundation in Phoenix. Cooper said about 100 kids a night are flocking to his Solid Rock center, which opened about two years ago. "If you take one kid out of a gang and get him involved in rock 'n' roll or get him involved in a guitar or bass or drums, you don't just change that kid, you change the neighborhood," he said. The Sioux Falls academy has had the feel of an exclusive, intimate venue this week, but starting in April it will become the afternoon home for young people looking to learn or improve their skills in guitar, bass, drums, keyboards or vocals. Lessons will be given in nine soundproof rehearsal rooms, five of which are wired to a professional mixing and recording studio. The four upstairs rehearsal rooms will honor KISS, with each decorated as an homage to the band members' characters: The Demon, Starchild, Catman and Spaceman. KISS' Thayer, who grew up playing saxophone in a school music program before he ever touched a guitar, said the facility will spark kids' creative side. "I'm blown away with this whole facility," Thayer said. "I think it's a great thing." KISS Army Ticket Pre-Sales Are Taking Place Soon! 2013 Premium KISS Army Fan Club Membership Kit includes all of the above items plus a Premium KISS Army 40th Anniversary denim jacket, with embroidered logos on chest and back! PLEASE NOTE: After purchasing your membership, you will receive two separate emails. One of them will provide instructions on how to redeem your fan club items. 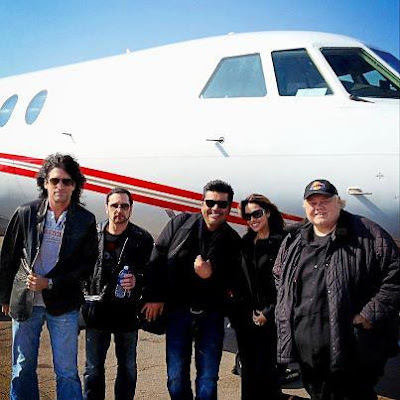 Here's a great photo of Tommy, Eric, George Lopez, and Louie Anderson with friend Stephanie arriving in Sioux Falls yesterday! They shared a plane ride to South Dakota to perform at a benefit for Chuck Brennan's Rock and Roll Academy. Of George and Louie' performances, Eric says "Louie Anderson and George Lopez KILLED IT last night!" Tonight Tommy and Eric will perform, along with Robby Krieger from the Doors, Sebastian Bach and Alice Cooper. Several sources tell us that KISS should be making a major concert announcement sometime at the beginning of next week. Join the band on creating the song "Sure Know Something" from their 1979 album "Dynasty". Peanut butter and chocolate, chips and dip, Hello Kitty and KISS? 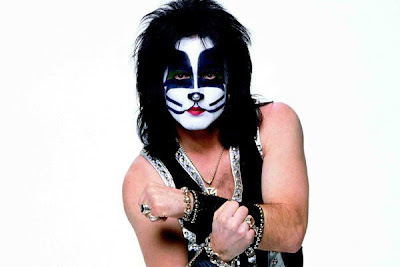 Kiss Hello Kitty (working title) is now in development with KISS frontmant Gene Simmons signed on to executive produce. 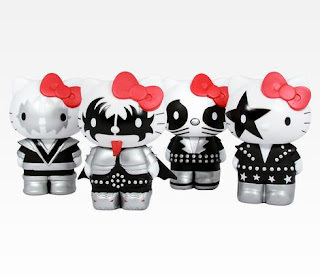 While the pairing may seem unlikely and unexpected to grownups, any Hello Kitty fan can tell you that the show is actually a brand extension from a series of Kiss x Hello Kitty products, which feature Hello Kitty wearing the trademark KISS make up. That product line debuted way back in 2010. 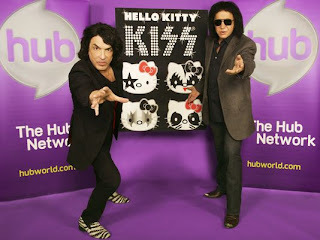 KISS’s Paul Stanley said about the project, “Knowing and viewing The Hub as I do daily with my three children, it is the perfect home for us to bring the Kiss Hello Kitty juggernaut to yet another generation.” Hello Kitty , Chococat and Badzt Maru have not yet commented on the story. From the mid 1980s before joining KISS, drummer Eric Singer appeared with Brenda Holiday in this Girls Of Rock & Roll video. This is one of Eric's 1st professional appearances. Eric Singer also played many years with Alice Cooper, also with Black Sabbath, Queen's Brian May, Lita Ford, Badlands, Gary Moore, Avantasia, ESP (Eric Singer Project,) and appearances with many more artists. 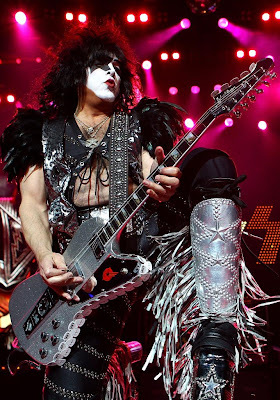 Then in 1989 he did Paul Stanley's solo tour and became a KISS family member since. He later recorded KISS Revenge in 1991 and joined the band. Eric also sings lead vocals with KISS on "All For The Love Of Rock & Roll" from their 2012 Monster album, on "All For The Glory" from their 2009 Sonic Boom album, plus "Black Diamond" from the 2008 Japan re-recordings album. Enjoy this unique gem from Eric's early career. You can meet Gene Simmons at Fandom Fest 2013, happening in Louisville, KY on July 26-28, 2013. Pictured is the actual KISS feature that ran in the New York Daily News last Sunday. Today I'm psyched to tell you that the adorable feline is poised to star in an animated series for The Hub. The unexpected twist is that it'll be a mashup ... with KISS. Yes, I'm serious: Kiss Hello Kitty (working title) is now in development, and it's based on this line of KISS x Hello Kitty products, which debuted in 2010. The show will feature "four KISS x Hello Kitty characters living their rock 'n' roll dreams and bringing pink anarchy to every situation they are in." 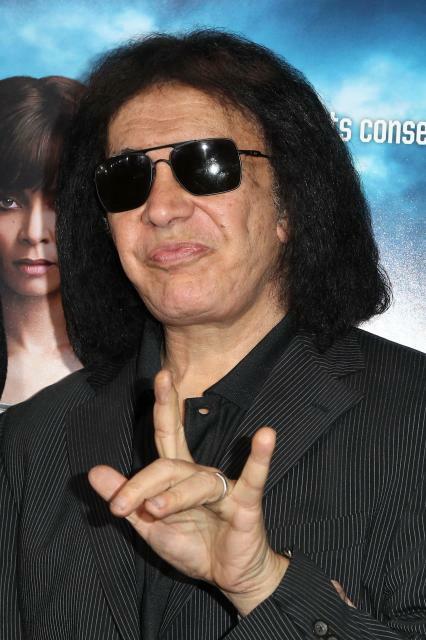 KISS' Gene Simmons is slated to be one of the executive producers, and the band sounds pretty pumped about the project. 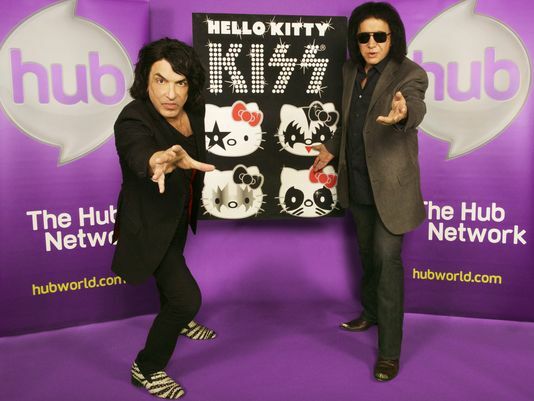 Says Paul Stanley: "Knowing and viewing The Hub as I do daily with my three children, it is the perfect home for us to bring the KISS Hello Kitty juggernaut to yet another generation." You heard it here first, folks. I'll keep you posted on when the series will make its debut. The Cabovisión team interviewed Paul Stanley and Gene Simmons, members of legendary rock & roll group Kiss, during their recent visit to Los Cabos. 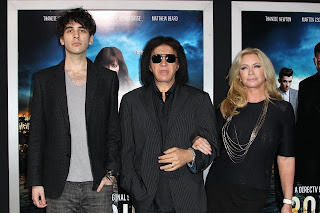 Gene Simmons, Shannon Tweed and son Nick attended the Los Angeles premiere of "Rogue" on March 26, 2013. Here's a photo of Paul Stanley in Mackay, Australia taken by photographer Ross Halfin. Here are a few photos from last weekend's Rock & Brews Grand Opening in Los Cabos, Mexico. 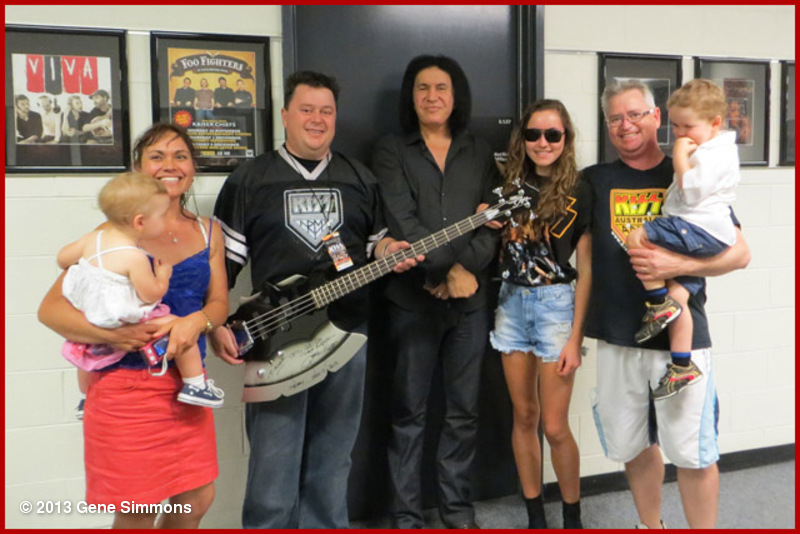 Paul Stanley and Gene Simmons co-hosted the rockin' event! 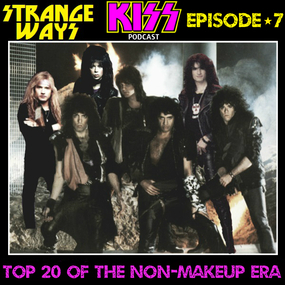 This installment finds your KISS army bruthas discussing the great unsung NON-MAKEUP Era! A great era with plenty of material to choose from, so get your list together and see if yours matches up to our picks for the 'TOP 20 of the NON-MAKEUP ERA'! Jeff and Jeff explore some of the greatest KISS RIFFS with a couple of Les Paul guitars. It's not a jam; it's an exploration of the music that makes KISS unique and powerful. Latest KISS Magazine Cover: "Ground Support"
KISS grace the cover of the April issue of the Mexican magazine "Ground Support". You can find a copy on eBay. Canadian rock reporter and photographer Mitch Lafon is no stranger to the world of rockstars. Having interviewed and photographed rock gods from every corner of the scene, Lafon is now turning his attention to a different aspect of the rock world — the philanthropic side. Mixing his personal experience, his love of KISS and his vast industry contacts, Lafon is organizing a 40th anniversary KISS tribute album, titled A World With Heroes, and he’s got musicians from bands like Guns N’ Roses, Great White, Firehouse, L.A. Guns and more getting on board to help make it happen. Lafon’s father-in-law died of cancer in January, and Lafon is honoring his memory by donating a portion of the proceeds of this project to the Vaudreuil-Solanges Palliative Care Unit, where his father-in-law received incredible care in his last days. Now, all Lafon needs is fan support to see his current PledgeMusic campaign through to the end. Get the details in our interview below and then pick the exclusive that looks best to you! You’ve talked about calling in favors from friends to get this project going, but did things ever snowball even further than that? Did friends call in favors from their friends? I’m not sure I’d call it “calling in favors” — these guys are doing it out of the kindness of their heart. Not because they feel they “owe” me anything. It has snowballed, Terry Ilous of Great White took a very hands-on approach and put me in touch with many other artists. He donated his time and knowledge to help make this come true. As you thought about raising funds for Vaudreuil-Solanges Palliative Care Unit, did you ever figure that the response would be this far-reaching with so many bands involved? What were your initial expectations when you started asking friends in the business to help you? I expected this would all be done within 24 hours with a lot of no’s or “We don’t have time now.” I never expected everybody to come on board and do it without ego or demands. They’ve all agreed to participate for the right reason — they simply want to help. It’s been very touching. What has been the single biggest surprise of all of the offers to be involved? Every single person that has offered their time is the biggest surprise. The saying is “time is money,” but everybody involved has said, “Just tell me what, where, where … and we’ll do it.” I can appreciate that donating their time is the most valuable asset and act of kindness. What made you decide on a KISS tribute album as the project to work toward? 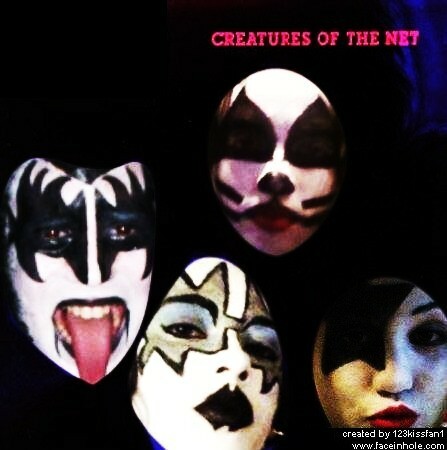 Well, I knew I needed to do something to raise awareness, and I happen to be a rabid KISS fan. My father-in-law passed away in January 2013, which also happened to mark KISS’ 40th anniversary. The epiphany came in the timing of both. Do you have a favorite KISS song? A? There are simply too many great KISS songs. The one in my head now is “I Stole Your Love” — a classic from the 1977 “Love Gun” album. For those who don’t know, can you tell us more about the Palliative Care Unit and what the money is going toward? The Vaudreuil-Soulanges Palliative Care Center is in Hudson, Quebec. It is where my father-in-law passed away on Jan 4, 2013. The care was dignified and wonderful. The reason I want to give back is because the center runs on donations and I want anyone that is going through or someday will go through what we had to endure to have this place for comfort, care and dignity of their loved one. The Center will use the money as necessary to provide the needed care. Simply, thank you. The Center did so much for my family, and with your help I can do a little something for them. For that I am eternally grateful. It cannot be done without you, so thank you. In episode #16 we talk about fan run KISS expos and the official KISS conventions. The good and the bad of fan KISS expos. Should KISS do KISS conventions again? 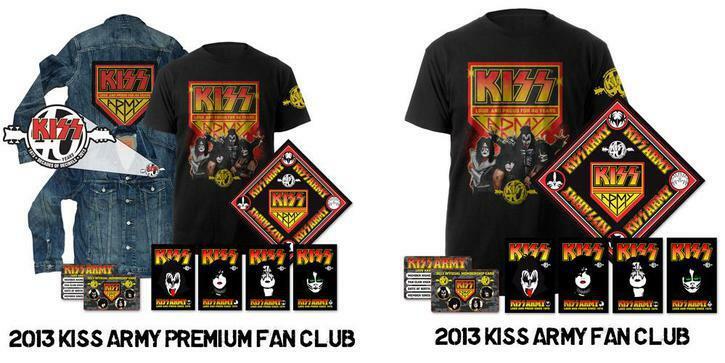 Is the KISS Kruise the new KISS convention? I just wanted to say a huge thank you for the opportunity to catch up, say g'day and meet you before the 1st Sydney concert. I have followed KISS for 33 years now and loved the journey but to finally meet you in person and get a hadn signed AXE was the opportunity of a lifetime for me. However this was only a small part of the whole night - thanks to Paul from GeneSimmons Axe my family also got the opportunity to meet you and this meant more to me than just being able to say g'day and meet you myself. The fact that we all found you to be very engaging and genuine as well as interested in us was more than I could have hoped for. I take my hat of to you and thank you. My nephew, Harry is 3 and he is the one who was giving you the bird as you walked up, he is also the one with Type 1 Diabetes and his parents (my brother) were blown away with how much time you gave us and the interest you took in his predicament. They are heavily involved in Juvenile Diabetes Foundation here is Australia and help organise a number of fundraising events throughout the year. It would be greatly appreciated if you could see your way to send a message of support to these kids and their families or even donate something for one of their charity events to help in some small way. We intend to promote the meet and greet we had with you and your genuine interest in the challenge that is Juevenile Diabetes, every little bit helps and we will continue to support and search for a cure. We loved every minute of our brief catch up, the AXE will be taking residence in a prime position for all to see and share, and finally the show as always was the hottest show on earth. Thanks for a great night and the once in a lifetime experience. Here's artist/model Claudia Costantino's tribute to Paul Stanley. It's not exactly the kind of snowman you expect to see peeking over the plowed piles. More unpublished classic photos from my personal collection...Who knew that the picture of Gene on the back of HTH was taken in a dumpy alley? Well, now you know!! BTW...ALWAYS loved this one time costume variation!! "This is "Shandie". Yep. Named after our song, that Paul wrote. At the end of my speaking gig, she stole the show when I said "You are a very impressive young lady and you will grow up to be a self empowered young woman." 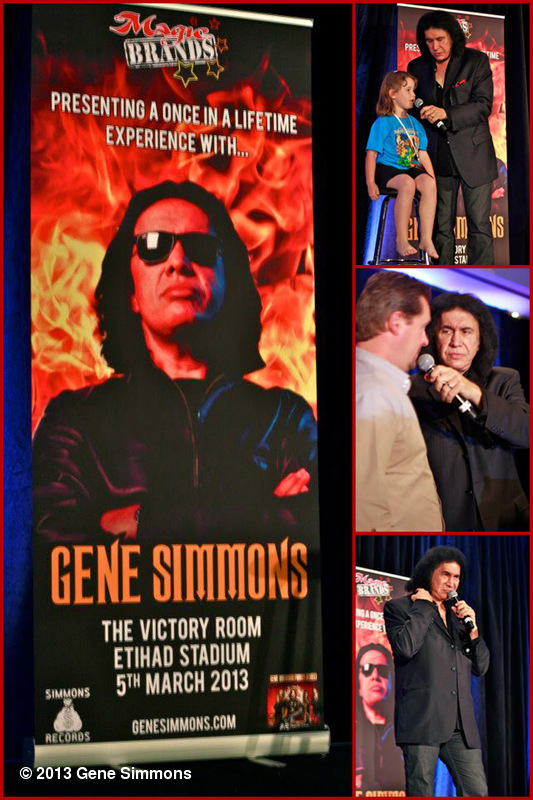 Thanks to the Peter Hoffmann family and Magic Brands for promoting my speaking engagement in Sydney. Here is a photo of the whole, delightful family. Magic Brands hosted an event in Sydney, Australia in early March, 2013. And, they asked me to be the speaker. It was a privilege. Now, it's true I love the sound of my own voice. Guilty as charged. But, after doing more than 50 speaking engagements around the world, what initially started out as a semi autobiographical/entrepreneural trip I have taken in my life, as turned into a very emotional journey for me. Initially, I started out talking about my self. My business philosophy. And my take-no-prinsoners attitude in life, love and business. What it quickly became, is a chance for me to get off the stage, walk out into the midst of the audience and engage in one on ones. About business. About life. About self empowerment. I have seen people well up in tears. I have seen them cry. Mostly, I try to hold back my own tears and control my emotions, because the events have taken on a life of their own for me. Through the lives and stories of people I speak with at these events, I learn something about myself. And that is, one should never take anything for granted. Not our well being (our health). Not where we live (Western Civiliation) and not our lot in life. That last one is the most flexible one of the lot. It means, you can always do better. You can always lead a healthier life. You can always be more giving and loving. You CAN succeed. I did. So, can you. Thank you to all the inspirational and motivational people I've met. You make my life richer." IDW Publishing will expand on its existing KISS comic book line this fall with a new all-ages series starring the titular rock stars as young children kicking out the jams as they foil the plans of their evil school principal. 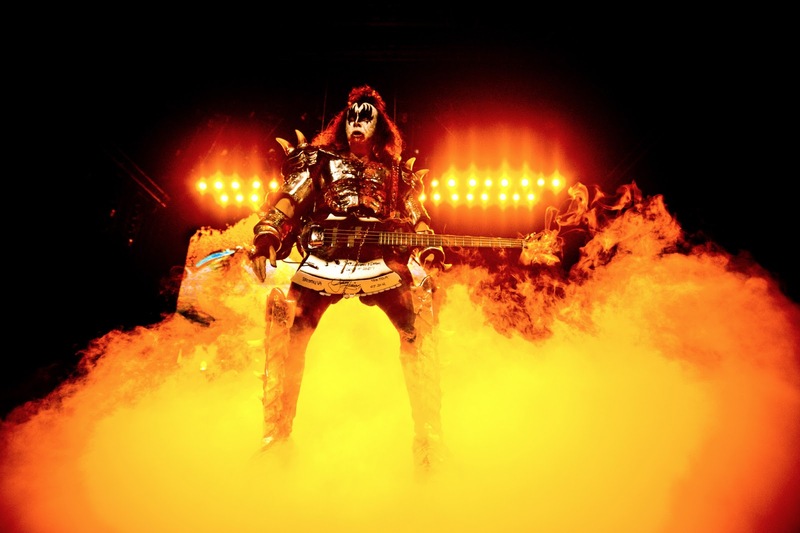 KISS Kids re-imagines bassist Gene Simmons' stage persona "The Demon" as "Li'l Demon"; guitarist Ace Frehley's "Spaceman" as "Spacey"; drummer Peter Criss' "Catman" as "Catkid"; and singer Paul Stanley's "Starchild" as, well, "Starchild," since that works just fine. KISS Kids will be hyped to KISS comic book fans in the form of a one-page strip printed on the back of all four issues of IDW's KISS Solo series, spotlighting each member of the band (presumably as grown-ups), but you can take an early look below. "KISS is used to rocking and rolling all night and partying every day, but back when they were little'uns, those things only happened around nap time," said Chris Ryall IDW's Chief Creative Officer/Editor-in-Chief and co-writer of KISS Kids with Tom Waltz. "This series will appeal to kids and Kiss fans of all ages, as we see the school-age band engage robots, evil teachers, other students, and much more, all filtered through the KISS lens. Beth, the school's Doctor Love, the snooty Torpedo Girls, the bratty "Wicked" Lester, nefarious Principal Elder... they're all here for this accessible, funny, and appealing new series." Drawn by Jose Holder (Mars Attacks, The Real Ghostbusters), KISS Kids #1 goes on sale later this fall in your local comic book store and digitally from ComiXology. The first phase of project construction to renovate the Oregon Military Museum will begin next month at Camp Withycombe in Clackamas. Removal of existing facilities at Camp Withycombe, an active Oregon National Guard post, will make room for new buildings, a plaza and a new entry gate, according to Gary Van Drew, senior project manager for the Oregon Military Department. The $6.5 million capital campaign to renovate the museum, which will commemorate the military service and sacrifice of all Oregonians who have served in the nation’s armed forces, continues with a fundraising event April 20 at the Governor Hotel in Portland. The All Star Salute will include a silent auction and live entertainment by Tommy Thayer of the rock band KISS, Patrick Lamb, Linda Hornbuckle, and Derrick McDuffey of Kingdom Sound. 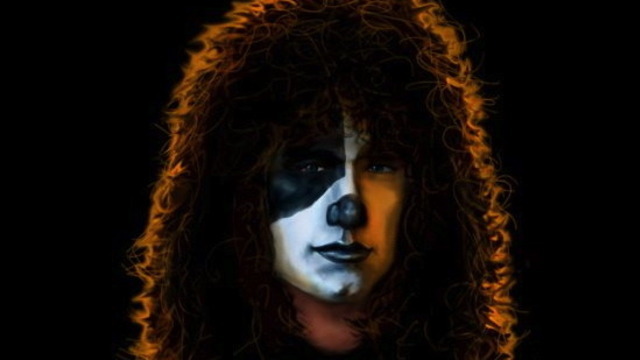 Tommy Thayer is the son of Brig. Gen. James B. Thayer, whom the museum will be named after. Brig. Gen. Thayer is an Oregon native who helped liberate a Nazi concentration camp during World War II. He earned a Silver Star and Bronze Star. Tickets for the All Star Salute are $150 each, of which $100 is tax-deductible are available by visiting the Oregon Historical Outreach website. For more information on the capital campaign and the Oregon Military Museum renovation, visit http://www.allstarsalute.com/. To make a donation, click on the “donate” button. Here's a photo of an Ampeg Dan Armstrong Plexi Bass that Gene Simmons gave to KISS drummer Eric Carr. Eric used the bass to write music with, to present to the band, in hope that they would use his material for a new KISS album. This Bass now hangs on the wall at the Hard Rock Cafe in Miami at Bayside Marketplace in Miami, FL. In 1969 Dan Armstrong-designed and -built "see-through" Ampeg guitars and basses (aka "Plexi", "Lucite" or "crystal" named after various brand names of acrylic glass). The guitars incorporated snap-in replaceable pickups to change the sound, and the short-scale basses used two stacked coils with a pan pot to gain a very wide range of tones. The transparent lucite bodies were Armstrong's original idea and contributed to incredibly long sustain but were very heavy. Ampeg's production of the "see-through" instruments ended in 1971 due to financial disagreements between Armstrong and Ampeg over amplifier designs. Check out this photo of a clear Punisher Bass made for Gene Simmons by Cara Hot-Rod Guitars. 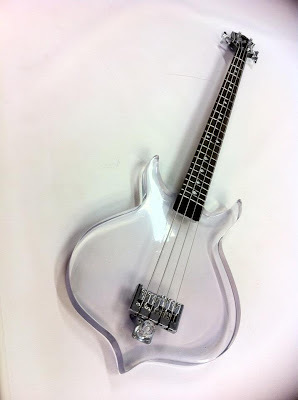 The bass is not made of Lexan or Lucite, or Plexiglas, nor Acrylic. Cara Hot-Rod Guitars makes the chemical compound in-house. Cara Hot-Rod Guitars: "Another revolutionary monster we made for Gene Simmons. It's electric and sounds like a demon beating on a grand piano in hell. I didn't put frets in the bottom of the neck with hopes of a neck pickup, but it failed. Created a proprietary pickup and output. Gene wanted a volume control on the front or else it would be totally clear. And no battery, it connects with a standard guitar cable." 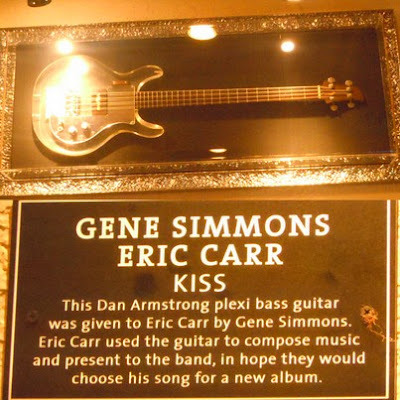 When a KISS fan asked Jim Cara to create an exact copy of the Gene Simmons Spector bass that made history during the 1970's, he had no idea it would eventually impress the man himself. The client handed the bass to Simmons at a show and Gene actually thought he had his old bass back, or at least a perfect clone. Cara didn't know that the Simmons was searching for an outside the box guitar scientist to help them perfect a few specialty one-of-a-kind instruments. After all, Chrome, Flames, and Leather go just as well with Hot Rod Guitars as they do with KISS. Paul Hayeland, director of GS AXE LTD, decided to give Original Cara Hot Rod Guitars a shot at making some projects happen. Dozens of prototypes later, Cara produced the elusive Chrome instruments for Simmons, as well as glass and studded instruments that completely identify with the Simmons stage persona. 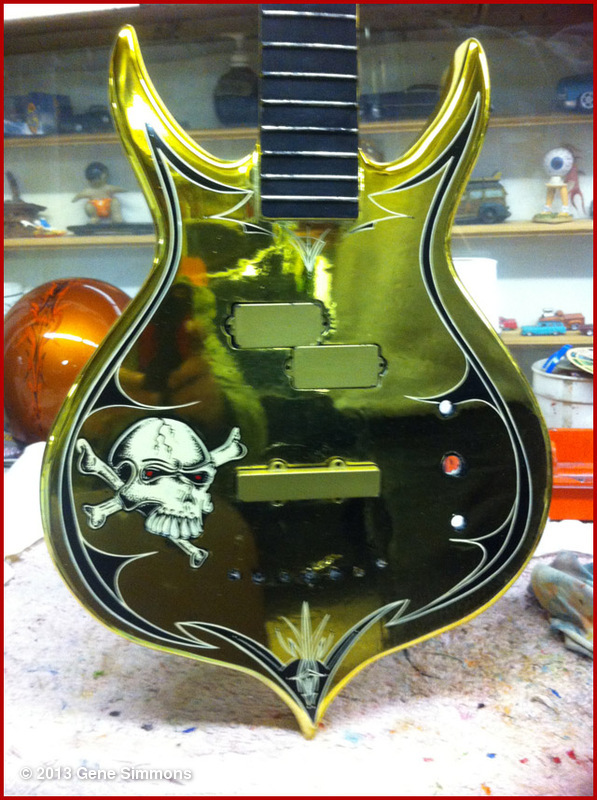 Each instrument is individually chromed and custom built, as Cara puts it, " There is no way to mass produce Chrome wood guitars, I have a education background in coatings. I just loved guitars. Many companies have tried Chrome on wood and I've watched and predicted the problems they would encounter. It was an honor for Gene and Paul to come to me for a solution and I don't think anyone is better fit for the job than Original Cara Hot Rod Guitars"
In addition to the Chrome Axe, GS AXE will be debuting a Clear Punisher bass, as well as a studded series, and a road worn reshaped Punisher. Back before they could afford to party all day, they were already rock ’n’ rolling all night. 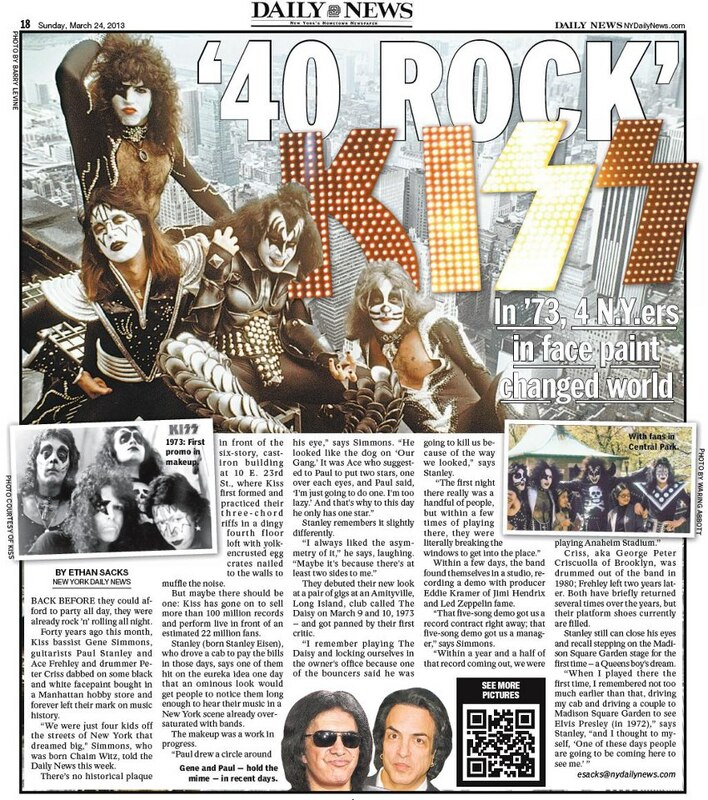 Forty years ago this month, Kiss bassist Gene Simmons, guitarists Paul Stanley and Ace Frehley and drummer Peter Criss dabbed on some black and white facepaint bought in a Manhattan hobby store and forever left their mark on music history. “We were just four kids off the streets of New York that dreamed big," Simmons, who was born Chaim Witz, told the Daily News this week. 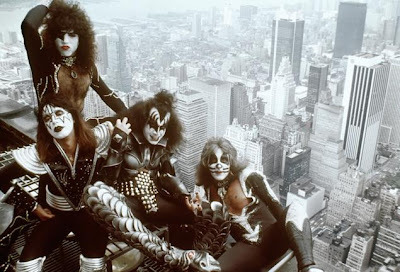 There’s no historical plaque in front of the six-story, cast-iron building at 10 E. 23rd St., where Kiss first formed and practiced their three-chord riffs in a dingy fourth floor loft with yolk-encrusted egg crates nailed to the walls to muffle the noise. But maybe there should be one: Kiss has gone on to sell more than 100 million records and perform live in front of an estimated 22 million fans. Stanley (born Stanley Eisen), who drove a cab to pay the bills in those days, says one of them hit on the eureka idea one day that an ominous look would get people to notice them long enough to hear their music in a New York scene already oversaturated with bands. The makeup was a work in progress. Stanley remembers it slightly differently. They debuted their new look at a pair of gigs at an Amityville, Long Island, club called The Daisy on March 9 and 10, 1973 — and got panned by their first critic. “I remember playing The Daisy and locking ourselves in the owner's office because one of the bouncers said he was going to kill us because of the way we looked,” says Stanley. Within a few days, the band found themselves in a studio, recording a demo with producer Eddie Kramer of Jimi Hendrix and Led Zeppelin fame. “That five-song demo got us a record contract right away; that five-song demo got us a manager,” says Simmons. Criss, aka George Peter Criscuolla of Brooklyn, was drummed out of the band in 1980; Frehley left two years later. Both have briefly returned several times over the years, but their platform shoes currently are filled. Stanley still can close his eyes and recall stepping on the Madison Square Garden stage for the first time — a Queens boy's dream. 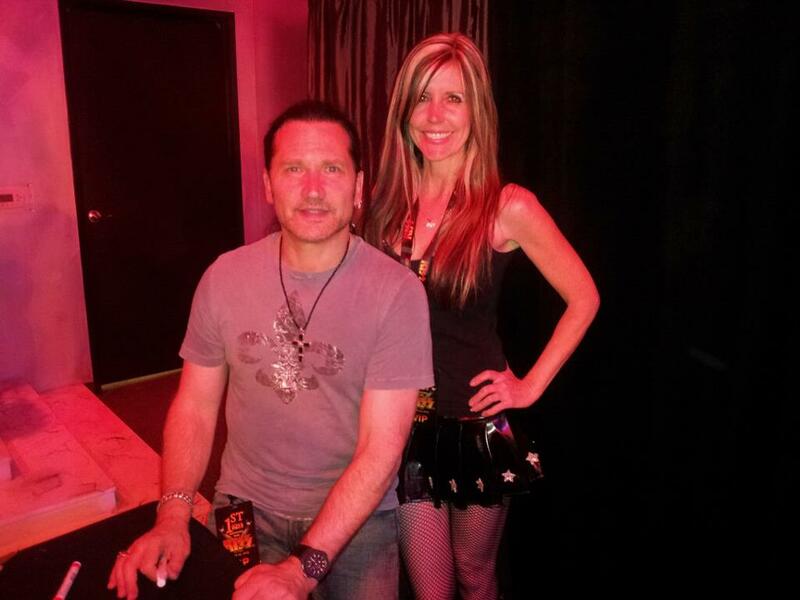 Here's a great photo of one half of the "KISS Army Vixens" Carol Port with KISS drummer Eric Singer at the one year anniversary of KISS by Monster Mini Golf on Saturday, March 23rd in Las Vegas. Drummer Eric Singer first became aware of KISS when he saw their picture in Rock Scene magazine. He’s now 22 years in the band and explains their mass appeal “from little kids up to people a lot older than us even at this point”, to Bryget Chrisfield. It’s the OG line-up of Mötley Crüe that’s heading Down Under, but only one half of this current KISS line-up are constant members: vocalist/rhythm guitarist Paul Stanley and vocalist/bassist Gene Simmons. Singer, who officially became KISS’s drummer after Eric Carr passed away in 1991, and lead guitarist Thomas Thayer – whose debut outing in The Spacesuit (replacing Ace Frehley) occurred in 2003 when the band recorded KISS Symphony: Alive IV with the Melbourne Symphony – round out the line-up. Given that Singer hasn’t always lorded over us from the KISS drum riser, when was it that he first became aware of KISS? “Um, I saw KISS in a magazine back in the ‘70s called Rock Scene,” he explains. “It was a rock magazine, but the print was almost like a newspaper; the cover was in colour, but all the content was black and white. I always thought that was the coolest magazine – that’s the one that I found I was influenced by the most and there was a section in it that had new bands. And it showed a picture of this band with makeup on. “Paul Stanley told me that bands would send their own picture in to promote themselves. So I cut that picture out and I remember I taped it or glued it to my little wardrobe, like an armoire, that I had in my bedroom. My mum reminded me of that; she remembered that I had done that. So I was attracted to the band from the first time I saw it, because I liked all the English glam-era bands: The Sweet, Mott The Hoople, T Rex, David Bowie – anything like that I was attracted to. [Coughs a loogie from his throat] Excuse me. So right away, of course, I saw KISS and then when I saw the album cover – I bought the first album, by the way – and I saw how they looked, and then hearing the music, to me somehow it all made sense: the logo, the look, the sound of the band. I thought, ‘Oh, this band’s got something unique going on here, I have a feeling this band’s gonna be something special. And, um, I think my instincts were right.” Singer acknowledges that “because [he’s] experienced it firsthand”, through his own life experiences, there might be some truth in the law of attraction. There’s such a strong visual component to being in KISS. When asked whether he has to drum in platform moon boots, Singer chuckles, “Noooo,” before pointing out he’s only required to rock the towering footwear for photo shoots. Then he pauses. “Well one time I actually did do that. We did a gig for a plus-size women’s clothing line here in America and they were doing a fashion show/runway thing in New York City. And a couple of models were Mia Tyler, Steven Tyler from Aerosmith’s daughter, and Anna Nicole Smith. So we did this thing and we had to basically lip sync playing to, like, five songs and then when we finished it we’d get up from behind our instruments and walk down the runaway with all the models to take pictures for the paparazzi. So I had to play in the platforms even though I wasn’t really playing live. And I remember the next thing my legs and ankles were just killing me. It was the most weirdest sensation and so awkward, but that’s the only time that I actually physically [drummed in platforms]. 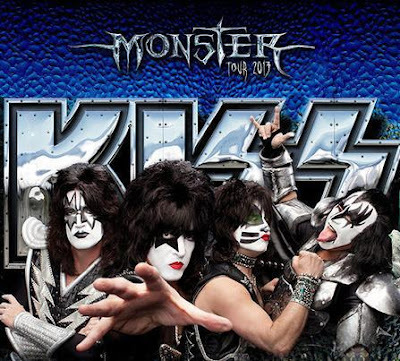 Monster is the latest (and 20th) KISS studio album and Singer offers, “I think we realise that KISS is what it is and you’re not trying to chase any trends, or be something you’re not… because at this point in everybody’s life nobody needs headaches to make it work. You have to be workman-like in the sense of your professionalism, and your due diligence, when it needs to apply. But ultimately you wanna be able to have fun. 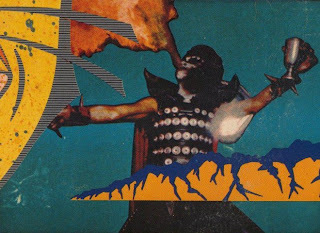 Here is part one of COTN’s three part series on the KISS album covers! This episode ‘covers’ from KISS’ debut album to Lick It Up. Lisa Jackson had a story to tell — and a lot of people wanted to hear it. The Austintown native had a close relationship with members of the rock band KISS that began in the mid-90s and went on for years. She was backstage before every concert, in the front row during the shows, and at the band’s hotel parties afterward. It was a time of all-access passes that made her the envy of the fire-spitting band’s diehard legions. She not only got a taste of the rock-star life but got to befriend her childhood idols. And people kept asking her for the details. 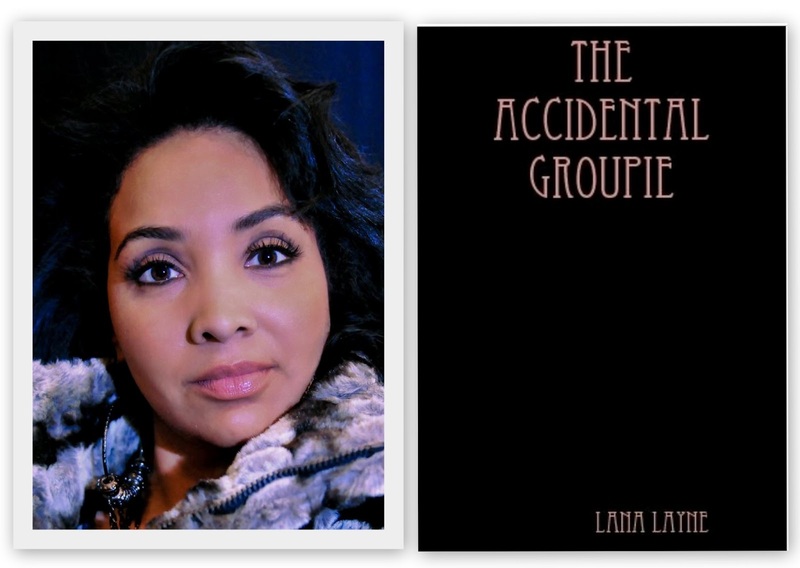 As a result, Jackson has written “The Accidental Groupie,” an e-novel that relives those days — albeit with thinly veiled pseudonyms for all involved. What’s unique about “The Accidental Groupie” is its female point of view. For a book about a band with a macho-partying image, there sure is a lot of detail about putting together the right outfit and hairstyle. There are fleeting glances of the salacious details, but the focus is plainly on the giddy fun of hobnobbing with her heroes in the major leagues of rock. It’s a slice of her life that was lived in segments when the band’s orbit brought it this way. Given the mercurial nature of that world, it’s not surprising that things fizzled out before they ever got old. 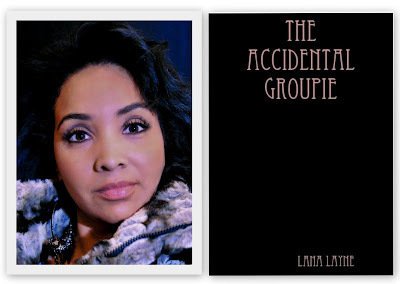 Still, “The Accidental Groupie” is a bouncy, breezy read, not a nasty tell-all book. It’s overriding characteristic is a sense of girlie fun and excitement, and a special concern for one band member in particular. The book can be ordered for the Kindle at amazon.com, or search the e-book section at lulu.com. Jackson uses the pen name Lana Layne because there already is a famed author with her name. She is mounting a kickstarter.com campaign to raise money to get the novel published in soft-cover. A Fitch High graduate who has a bachelor’s degree and several master’s degrees, Jackson began her career as a reporter for The Vindicator. In fact, her connection to KISS began at the paper when she contacted band guitarist Ace Frehley for a story on Gibson guitars. It was the day she finally spoke to her childhood idol. After that phone interview, she became a fax-and-phone pal with Frehley, and then, ultimately, an accidental groupie. Jackson’s love for the band goes way back — all the way to grade school — and her memory of the precise moment is still strong. But it was a fanaticism that many couldn’t accept or understand. As a black girl, she got grief from both white kids and black kids. “But I liked who I liked,” said Jackson, whose bedroom walls were bedecked with KISS posters. Jackon’s book gives a behind-the-scenes look at the band and conveys the thrill and anticipation that preceded their visits. Her friend Angel Talley of Austintown accompanied her on many nights. “It was an Alice in Wonderland experience,” she said. After leaving The Vindicator, Jackson worked for several years as a newspaper reporter in Detroit. She would later move on to the academic world and worked at several colleges. Most recently, after the death of her mother, she moved to Las Vegas for a fresh start. She now works in marketing for a printing company and also as a makeup artist. Jackson said she has other novels in her, but first she plans to see how far she can take “The Accidental Groupie. KISSopolis.com has crossed a milestone reaching our 2 millionth visitor on Saturday, March 23, 2013. We're very happy for the continuing growth of our KISS fan website and thank you for using KISSopolis as one of your sources for KISS news. We're not bragging - we're just shocked! 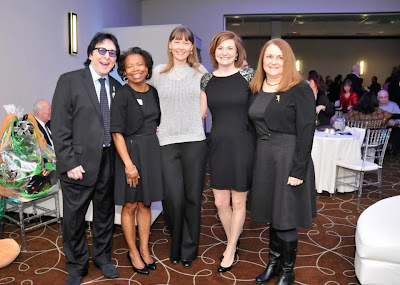 Original KISS drummer Peter Criss receives the 'Humanitarian Of The Year Award' from the American Cancer Society on Saturday, March 9, 2013 at Encore Event Center. Here's KISS guitarist Tommy Thayer congratulating Epiphone on their 140th anniversary. 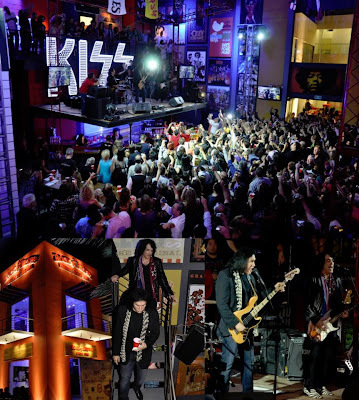 Here's fan video of Paul Stanley and Gene Simmons playing "Rock And Roll All Nite" with members of the house band at the Rock & Brews opening in Los Cabos, Mexico. 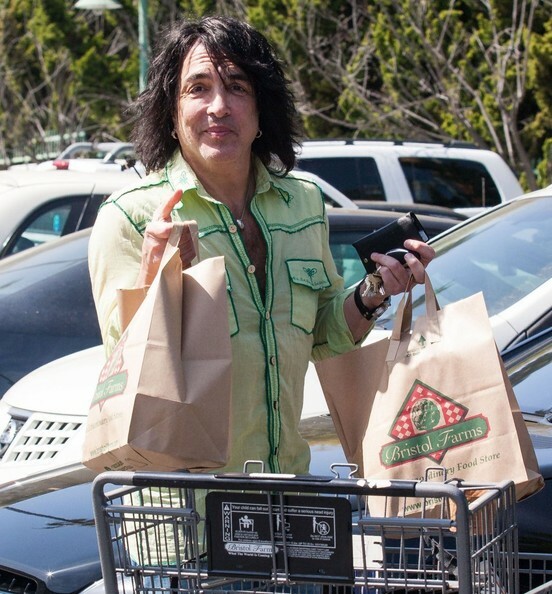 Paul Stanley doesn’t do anything half speed. The KISS frontman is now getting into the restaurant biz. He and bandmate Gene Simmons will co-host this weekend’s opening of Rock & Brews in San Jose del Cabo, Mexico. There are plans for 50-plus locations in North America, possibly Miami. So taking on the restaurant business now? Absolutely, man. Obviously for me to get involved in something worthwhile is important. I’m not out there selling liquid, soap or detergents. The idea when I got involved was that I was never going to be in the back seat. I have a pizza oven at home, I grow my own produce, so I know a lot about what we are doing. 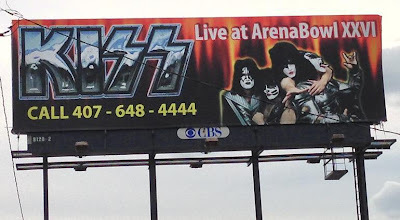 Is KISS ever going to show up and play? There is no live music. You can see the lyrics on the screens so you can pick up the words you’ve never heard before [laughs]. Want to talk a little bit about the latest ‘Monster’ album? I couldn’t be more pleased or proud of it. It speaks a lot about the band and it really backs up what this band is about, what it’s been about and what the future holds for us. One of my rules for this album was no recycled old material. And don’t reinvent the wheel. A lot of times as you grow you learn your craft better, but you don’t necessarily become better at it. You may become a technically better songwriter, but you’re not writing better songs. So the idea for me was: Let’s simplify things and don’t over-think things. You have four kids now. How is dad doing? I am a lucky guy. Amazing wife [ Erin Sutton], amazing kids. Emily is 19 months now, Sarah is 4, Colin is 6, Evan is 18. I’ve been busy and staying busy. Word is Evan is an amazing guitarist. He is. He is phenomenal. He was born to play. A lot of people have heard him and ask why I wasn’t as good as him at his age and I say I’m not as good as him now! 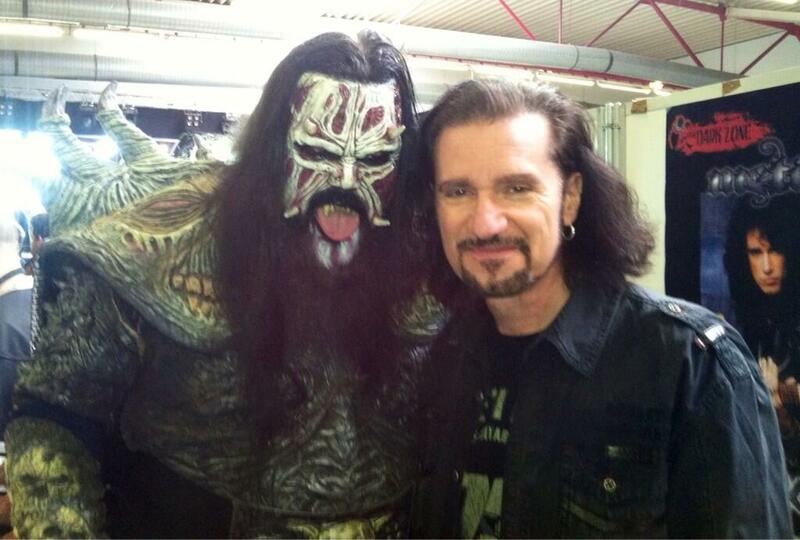 Here's a photo of former KISS guitarist Bruce Kulick posing with Mr. Lordi at the Movie Days in Dortmund, Germany. Bruce writes: "Mr Lordi and I at the Movie-Days Convention in Dortmund Germany. It's a huge Horror, Sci-Fi, R'N'R. Cool!" 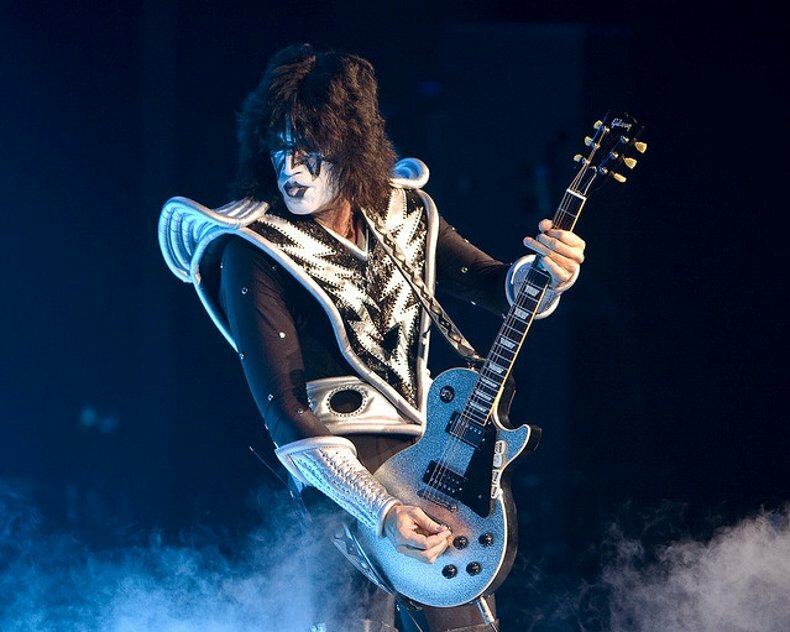 According to the Courthouse News Service, a brain cancer patient who attended a KISS concert in St. Louis last year has sued show promoter Live Nation and others, claiming that he was injured by a flying debris from a cannon. 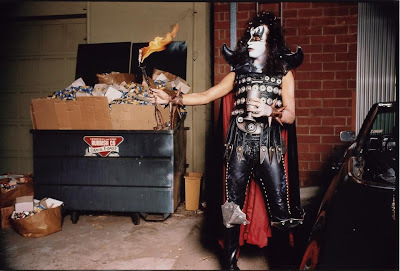 The alleged incident occurred during the final song of KISS' set, "Rock And Roll All Nite" (see video below), when William Mueller Jr. claims the cannon "exploded and with great force launched a metal ratchet tie-down strap" that hit him while he was standing at his assigned seat. "(P)rior to this incident plaintiff had been diagnosed with a rare brain cancer (Esthesioneuroblastoma) and had experienced major surgeries and intense radiation therapy," Mueller says in the complaint. "At the time of his injury, plaintiff's body was in a weakened and vulnerable condition. "Defendants owed to plaintiff the duty to exercise the highest degree of care for his safety. Defendants actions, conduct, or omissions were negligent, negligent per se, or both and were not those of a reasonably prudent person." The members of KISS are not a parties to the complaint, which was filed in St. Louis County Circuit Court. IDW Explores Its Inner Demon Child With "KISS Kids"
Ah, the simple pleasures of just being a kid. Lemonade stands, little league games, advanced fort building, rocking the faces off of millions of screaming fans all over the world while thwarting the plans of your evil school Principal. If a couple of those cherished childhood memories sound unfamiliar, that’s because they can only be found in KISS Kids, the new series starring the pint-sized rock gods! Join Starchild, Li’l Demon, Spacey, and Catkid as they get into trouble and kick out the jams in strips featuring familiar characters and settings from KISS lore. Helmed by KISS series writers Chris Ryall and Tom Waltz with fun, expressive art by Jose Holder (Mars Attacks The Real Ghostbusters), KISS Kids promises to be a treat for fans of all-ages! 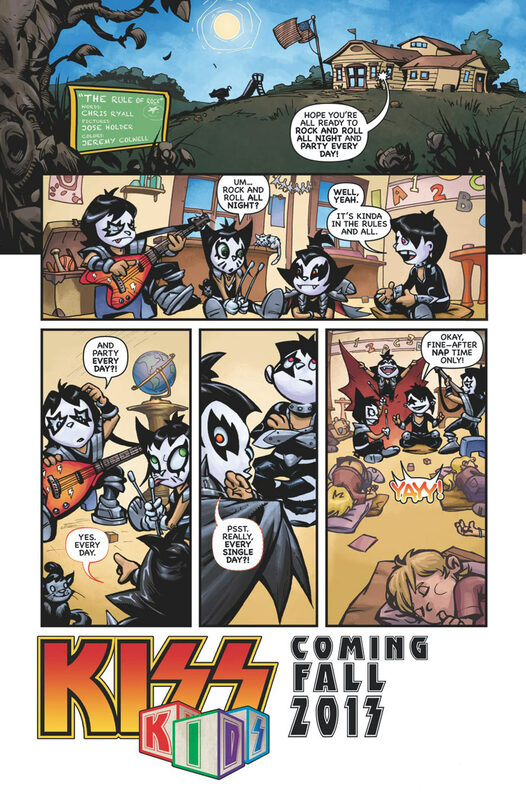 The new KISS Kids series, coming this fall, is being previewed in the form of a one-page strip on the back cover of all four issues of this spring’s Kiss Solo series. Fans will get their first real look at the Kiss Kids on April 10, when Kiss Solo #1: The Demon by Ryall and artist Angel Medina is released. 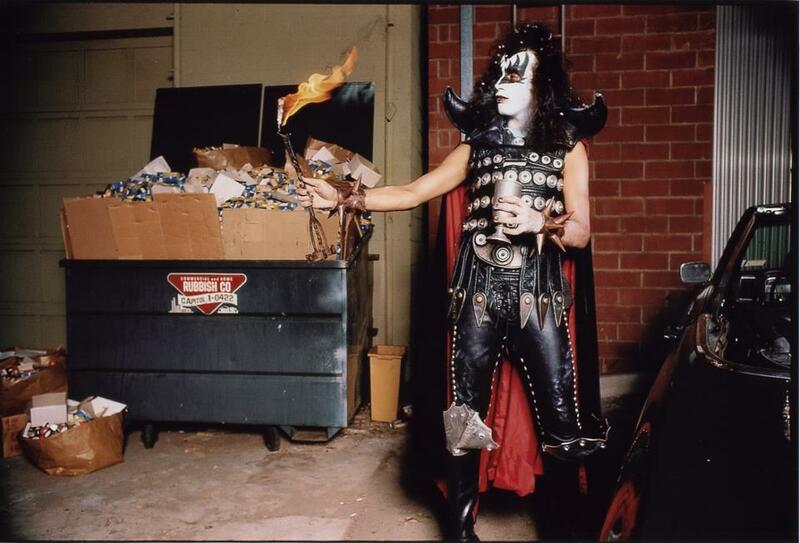 "Rock and Roll All Nite….and Potty Every Day," added the L’il Demon himself, Kiss founding member, Gene Simmons. This fall, there’s only one place for proof positive that whether you’re a Starchild or a Demon, there’s nothing better than rocking and rolling all night and reading comics every day! 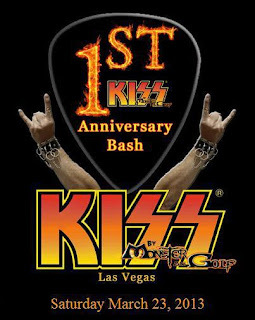 Celebrate the one year anniversary of KISS by Monster Mini Golf with a special VIP Party on today, March 23rd from 6pm - 8pm in Las Vegas! Special guest KISS drummer Eric Singer will be available for photos and autographs, and will also be doing an intimate Q&A! Platinum and MONSTER ticket packages are available for the VIP Party. Sales are limited as we would like everyone in attendance to enjoy the party! The day will kick off with a free KISS Expo outside in the parking lot of KISS by Monster Mini Golf from 10am - 6pm. Special Expo Guests include Bob Kulick and Ken Kelly. - Shop for KISS collectibles at a KISS venue! - Get your Face "KISS" Painted! - Get your Photo taken in the KISS boots! Due to technical difficulties, we lost episode 7, so we had to go with plan B, at least for now...Episode 7 coming soon, but this episode is still pretty rad. Enjoy, KISS army! KISS band member Paul Stanley and his wife Erin Sutton out grocery shopping at Bristol Farms in West Hollywood, California on March 21, 2013. 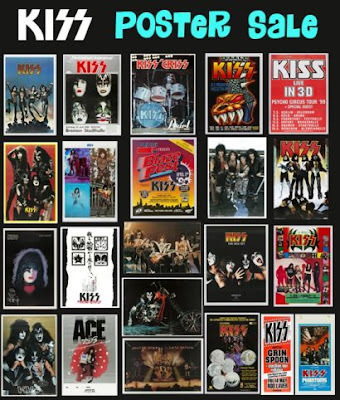 Kiss-museum.com is selling a large collection of KISS poster from the '70s to the present. KISS Museum: "Most are singles so make sure you check them out before they are all gone. Each has been painstakingly photographed and graded. You will not believe the amazing items we have!" 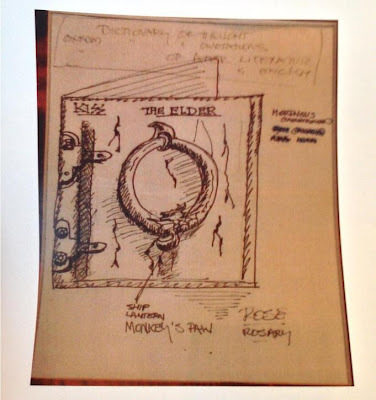 Check out this incredible hand-drawn sketch of the Elder album cover that Gene drew and just re-discovered in his collection this week! 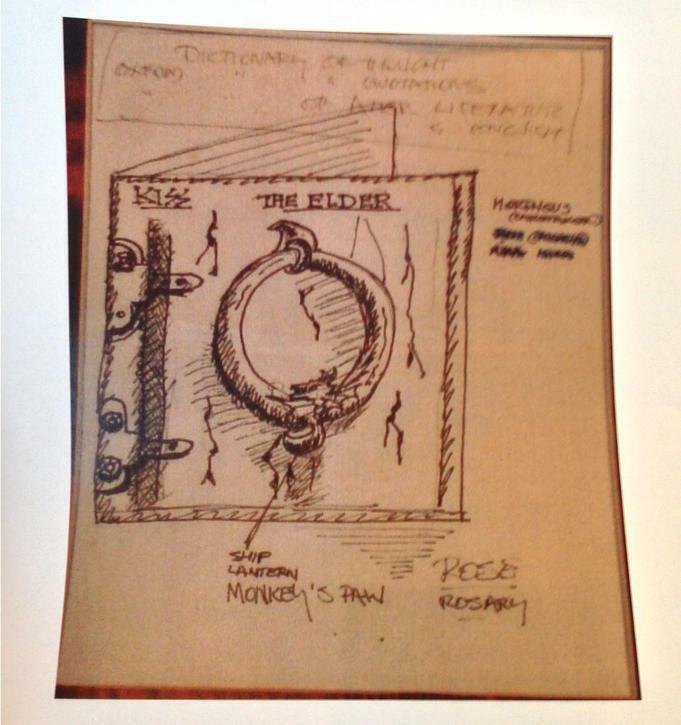 Take note of the details he's written around the sketch too. Photo Credit: "KISS CATALOG, LTD"
Here's a photo of Gene Simmons that you'll find in the pages of the new KISS Monster Tour / 40th Anniversary Program. The new tour book celebrates 40 years of KISS. This photo was taken in Bristow, VA on July 20, 2012. Click on the photo to view larger image.